It’s a bird. It’s a plane. It’s Superman. Wait — it’s Superwoman. On July 6 at the Truckee Tahoe Airport, the community can look up and watch a woman fly her shiny blue, black and silver Edge 540, and do barrel rolls around Superman — or, rather, her husband — while he freefalls in his wingsuit — an astonishing air show performance like nothing you have ever seen before. 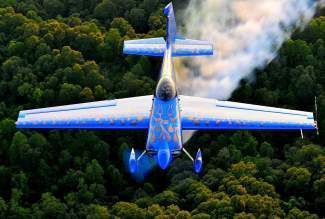 Melissa Pemberton, 28, is a champion aerobatic pilot who, with her husband Rex, will be giving spectators the show of a lifetime at the second annual Truckee Tahoe AirFair & Family Festival. They will also open the event when Rex parachutes onto the scene carrying a 1,000 square foot American flag, whi.e Melissa circles in her Edge with a smoke trail overhead. The duo met in 2006 while BASE-jumping in Australia’s Blue Mountains. Only 22 at the time, Melissa was an accomplished rock climber, skydiver, BASE-jumper, as well as aerobatic competitor. She had just qualified to be on the U.S. Aerobatic Team, the youngest woman ever. That same year, Rex, an avid mountain climber, became the youngest Australian to summit the seven highest peaks on the seven continents of the world, including Mt. Everest. Based in Groveland, Calif., near Yosemite, Melissa and Rex Pemberton have many friends in the Tahoe area who are climbers, backcountry skiers and BASE-jumpers. Her first aviation influence growing up in Pennsylvania was her grandmother, an avid pilot and flight instructor. Although her parents were not pilots, Melissa’s father was a rock climber and commercial scuba diver who encouraged her to do everything, but use good sense. When her grandmother was convinced that Melissa was serious about flying, she paid her granddaughter’s way to Embry-Riddle Aeronautical University in Arizona where Melissa earned her private pilot certificate. Soon after, inspired by a program called “Stars of Tomorrow” to encourage young air show performers, she began training with some of the best aerobatic coaches in the world, then entered, and won, collegiate and regional competitions. Melissa compares the focus required for rock climbing, skydiving or BASE-jumping with that of flying aerobatic maneuvers. “It’s incredibly similar,” she says. “A lot of people will see a video of me flying, and, when they meet me, they say, ‘Wow, it looks like you become a different person when you get into the cockpit.’ I don’t have a choice of losing that focus when doing something where a moment of being distracted could result in an accident. Few people, even in Tahoe, have ever seen wingsuit flying in person, and Rex and Melissa’s unique act is one they created five years ago and have been doing ever since. What is the audience reaction to their wingsuit and aerobatics display? Female aerobatic performers are still rare. However, outside of the U.S., they’re even more unlikely. Melissa performs in countries around the world, including Europe and Central America. She remembers a moving encounter at an air show in El Salvador. Speaking to women or children, especially girls, is important to Melissa because of her own memorable experience meeting Julie Clark, one of the best female aerobatic performers in the world.